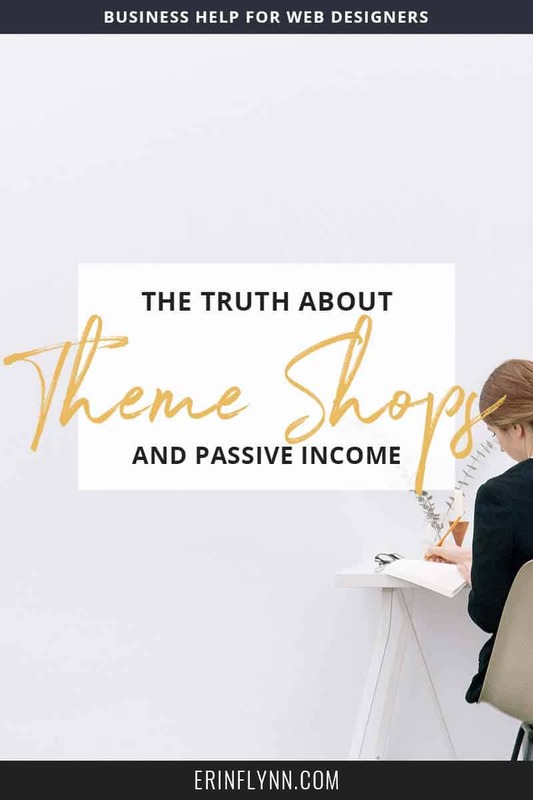 One of the questions often I get from my students is whether they should create a theme shop to get some passive income coming in. But theme shops are not passive. In fact, running a theme shop is a lot of work, and very little of that work is design or development, which is what most of my students want to spend more time doing. The idea of passive income is that you make something once, and then people can buy it over and over. Theoretically, if you make a website theme once, it can sell hundreds or thousands of times, with little work on your part. While it’s true that if you design and code a theme once, you’re done with the design and coding (save any potential bug fixes or updates), you still have to sell it. For web designers who are struggling to make 1-4 sales per month of custom websites (which is why they want that passive income), needing to sell 10-40 themes per month to make the same income is a big job. Because while you can make one sale of a custom website for thousands of dollars, you’d have to sell a large quantity of themes to make the same. Let’s say you’re currently selling custom websites for $2,500 (which is low, but that’s a topic for another day). You need to make one custom website sale per month to bring in that amount. If you wanted to replace that with a theme shop instead, you’re going to have to sell a lot more. If you price your themes at $100, which is pretty premium pricing, you’d have to sell 25 themes to replace the income from a custom website. That means you have to get in front of approximately 25 times more people to make the sales you need. Because just because the price is lower, doesn’t mean sales are easier. In fact, sales may be harder because you’re not going to be talking to each customer one-on-one to show them how your themes meet their particular needs. If you’ve already built up a big audience and think adding in a theme shop will magically turn them into customers, you’re wrong. People who are following you because of your custom work, likely want custom work, not a template everyone else can buy. When you first launch your theme shop, you likely will convert portions of your audience who liked your work but maybe can’t afford you or who aren’t ready to purchase something custom. But this likely won’t be the majority of your audience. So that means you’re going to need to build a new audience, who is interested in buying pre-made themes. Which also means that you’re now going to be marketing to two separate audiences, once for your theme shop, and one for custom work (at least until the theme shop takes off). You’re now doing double marketing. As much as we’d love for people to pay us money, download our themes, install them, and then just be happy campers, it doesn’t work that way. Customers get in over their heads, want to change things, or white-screen their websites and head to you for support. While most theme shops have support staff, you’ll likely be doing all of it until your shop becomes highly profitable. Of course, you’ll choose your target audience, but the audience you choose can have a big impact on how much support you have to provide. If you target newer online entrepreneurs, they may not have great tech skills. Which means they may have trouble simply getting your themes installed. And while great documentation helps, you’ll still be getting requests for extra hand-holding. If you target a techier crowd, like web designers who will use the themes with their clients, you’ll be cutting down on basic support questions–but likely getting more advanced ones as they try to customize your theme to their client’s needs. It will be very important to set boundaries and have clarity around what counts as support and what falls outside of what you’re willing to provide in the cost of the theme. This is something I’ve struggled with the most when it comes to selling products. No matter how clear you make your marketing, you’ll always have people who fall outside your target audience buying. For me, nine times out of ten, problem customers are people who fall outside of my target market, but purchased anyhow. These people would have been screened out if I were offering a custom project, but because I have no real control over who clicks the “buy” button, they make it through. Of course, your marketing will help screen these people out, but nothing is 100%. That’s why when I had my theme shop for blogs, people were trying to turn my themes into ecommerce shops and complaining that they weren’t styled correctly. That’s why now that I offer courses for web designers, I have other creatives buying and complaining that portions of the content only talk about websites. You only have so much control, and the lower your prices, the more people will buy it to “see if it works,” and then complain when it doesn’t. Theme shops are not passive. Theme shops require a lot of marketing, far more than selling custom websites, simply because the price point of what you’re selling is so much lower. You’ll need to build up the right audience, of your ideal clients who want themes, this will take some time and a lot of effort. You’ll have to provide support. Choosing the right audience can reduce the amount of support, but you’ll always have to provide some. And you can’t choose your customers. Despite your best marketing efforts, you’re not able to screen clients with a theme shop the way you can with custom work. Which means every so often you’ll get problem clients who never should have bought your product in the first place, but who now need you to help them. If these problems don’t scare you away, you may make a great theme shop owner! My personal vote? Skip the theme shop and charge more for your custom websites.